I got so caught up with Mama changing Trevor’s loaded diaper that I had to go back and start all over again 🙂 Sweet love story here. Thank you granonine! I enjoyed writing it too! Love this… tells a lot what it means to be poor. Unless you have lived poor, you really don’t understand the gravity of it. Thank you so much! Enjoyable story told from the perspective of a mother teaching her children a valuable lesson. Nicely done! I’m so glad you enjoyed my story! I grew up on a chicken farm. We weren’t really poor, but there wasn’t extra money for frivolous purchases. It was fun though, We had a blast! Hi draliman! Yes, like minds are very helpful. Thanks for stopping by! Ah, bonding over duct tape. I really like the direction you took these boots. Thank you very much for reading my story Alicia! My son duct taped his favorite gym shoes to get through a game once. We were rushed, but It was great story! Dear lisarey1990, Thank you so very much for reading my story. I enjoyed writing it! Thank you Donna! I’m glad you stopped by! I’m so glad you stopped by michaelwynauthor. I enjoyed writing this piece. Love the depth of feeling and love in this story. Well done. So much love in this simple story. I could see the two of them, her in her soggy boots and him with his duct taped bicycle. Sweet. Thank you so much Rochelle! I really enjoyed writing this story – I have a son that isn’t poor, but he is so frugal that he once duct taped his Nike shoes. Great tale! The mother, even after experiencing poverty, seems pretty optimistic for the sake of her children. Hi shivamt25! Thank you for stopping by and reading my story. I’m glad you like it! Wonderful how you kept the kids, and reader, guessing until the end. Of course, asking for some duct tape gets you a man. 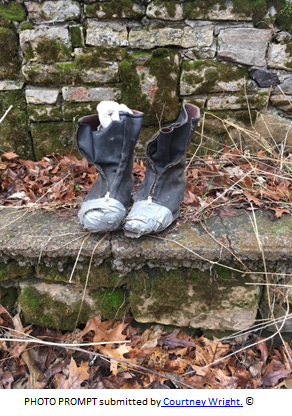 I can see these boots remaining the family forever, being passed down with the story and love they represent. Hi Sarah Ann! I’m so glad you like my story. I had fun writing this one. Thanks! This is a so amazing tale.. Sweet.. U have shown that happiness yet.. I really appreciate your comment syncwithdeep! Thank you for stopping by! Duct tape will fix anything – even hearts. You bought a smile to my face. I’m so happy you like my story! Duct tape is the fix-all! Thanks! You create such a personal and homely moment for Mama and her children, with tender reminiscences of dad & his duct tape. Lovely. Wow, this is such a nice complement and I’m glad you liked it. Thank you so much! Very cute LOVE story. You are an amazing writer. I am always impressed with your creative stories. Thanks hon! I had fun writing this. Ah, he rescued the damsel in distress. No wonder she fell for him. Loved the line about “didn’t know what poor looked like.” Great story, Nan. I wad mesmerized too… great story. Such heart. Why thank you Laurie! Duct tape can be used to keep a bumper on a car, so I’ve heard. I’m sure you wouldn’t be able to go on a cross-country trek. A damsel in distress and a hero. Thank you Dawn. Hey, I’m a romantic at heart. Thanks! I like the soaked feet and broken bike. Made for each other. Thank you Phyllis. Duct tape can fix just about anything! Thanks! Agreed, Nan. It even keeps warps out of my kitchen. The children might not know about poor but they will surely know about love. Cute story. (PS I expect a reply sometime in 2022). I certainly hope so subroto! Thank you for stopping by! I really do think children need to know what their parents went through growing up. Not the “I walked to school uphill both ways” but, the overall tapestry of their lives. Kids love to know about their parents. I’m glad you loved it kasturi! I enjoyed writing it too. A fun picture prompt! Thank you Norma! I really am glad you liked it! A great story. Affection and gratitude go a long way toward making poverty not such a hardship. You are absolutely correct. Without love and gratuitous affection, Attitude is more than half the battle! Thank you! Right on Dale! There isn’t a monopoly on love and affection for the rich. Everyone is rich if they are loved and love. Who knew that duct tape could be so romantic. Lovely story.